Summary : A whole fruit tea that yes indeedy does taste like strawberries. If you and strawberries are a match made in heaven, it is time to head over to Culinary Teas and pick yourself up some of this tasty and enjoyable summertime tea. Review : In my book, a short book admittedly, the month of December is one month I could very happily live without. Gone are the days of tons of presents under the tree. Here are the days of being exiled back to the frigid Midwest to be with family over Christmas. I hate December. Despise it, actually. The days continue to get colder, with no end in sight. The days grow shorter, and shorter, and shorter. Winter is here...and truth to be told...I really don't like winter that much anymore. Perhaps why I hide out in Nevada? But regardless, it is during this time of year that not only does tea become my favorite drink...summer time teas leap in importance. A summer time tea is, at least for me, a tea that brings back memories of summer...however briefly. What that means is that I'll try any tea that even remotely "smacks of summer." If the label says summer, or the fruit contains a summer fruit...it's a highly safe bet that I'll try the tea sooner rather than later. And so it happened on one December night that while picking through my selection of teas, I came across a neglected sampler of Strawberry Kiwi Herbal Tea from Culinary Teas. Strawberries is the ultimate of summer fuits, and since it was in the name, well...I felt compelled to give this tea a try. 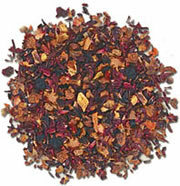 Here is how Culinary Teas describes this tea on their website :"A delicious combination of these two fruits. Strawberry Kiwi herbal tea is quite full bodied with excellent flavor. Children love this one made into Popsicles." This tea contains the following ingredients : Hibiscus petals, Rosehip chips, Dried apple pieces, Dried sweet orange peel, Natural Flavors. Now, this is a whole fruit tea. What that means is that the tea contains no "tea leaves" per se. Instead, it is just various dried fruit pieces and "other natural flavors." And my, the whole fruit pieces in this tea are huge. Moreover, the fruit pieces aren't some leftover thing scraped off the bottom of a long-dead apple tree. Instead, these fruit pieces are tasty...and pungent. Once you rip open the top of the bag this tea is packed in, you'll be greeted with a very powerful aroma of strawberries - always a happy smell in December. But in the end, none of this is important if the tea was bad. Happily, this tea was very tasty. Granted, if you don't like strawberries, you won't like this tea. But if you and strawberries are the perfect date, then odds are exceptionally high that you and this tea will have a happy future together. To put it perhaps more bluntly, this is a strawberry tea, with a faint taste of apple buried under the overwhelming, and good, flavor of strawberries. Oh, and as for whether this tea makes for a good popscile, I have not the first clue. But perhaps once the desert heat of Nevada sets in this upcoming summer I'll give it a try...I can see where this could indeed be a tasty summer time treat too. Recommendation : Yes. If you crave strawberries, then this is the tea for you...period. If you don't like strawberries, well, find something else.